The panorama of Southwest Alaska ranges from the gentle grasslands of the Aleutian Islands to the surreal volcanic landscape of Katmai National Park. In McNeil River State Game Sanctuary up to 2,500 brown bears congregate in the summer to feed on salmon. The Pribilof Islands offer unsurpassed sea bird and fur seal viewing. Fly-in fishing lodges dot the wilderness. 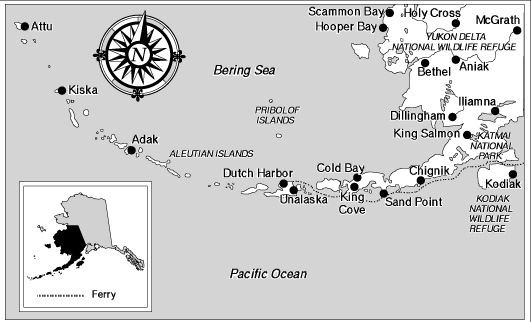 The principal ports are Kodiak, Dillingham, Dutch Harbor/Unalaska, and King Salmon. The Yupik Eskimo community of Bethel is a major port serving as a commercial hub for villages of the Yukon and Kuskokwim river deltas. The Native people, known for their excellent basketry, are both Yupik Eskimo and Aleut. The waters are teeming with abundant marine life, and 230 species of birds frequent the Aleutian chain, the longest archipelago of small islands in the world. The area is accessible only by air and water. Above the Yukon River, beyond the vast Brooks Range, the summer tundra unrolls a carpet of delicate wildflowers to meet the Arctic coast. This is the home of the Inupiat Eskimos, the land of Northern Lights and the Midnight Sun. Traditional Eskimo life-style, modern oil field technology, and immense herds of wild caribou coexist in an environment that is both fierce and fragile. Migratory birds and marine mammals abound, and some of Americas finest wilderness parklands are found in this area. Gates of the Arctic National Park & Preserve, with adjacent Noatak National Preserve and Kobuk Valley National Park, comprises one of the worlds largest parkland areas. The 180,000 member Porcupine Caribou Herd migrates through the Arctic National Wildlife Refuge. 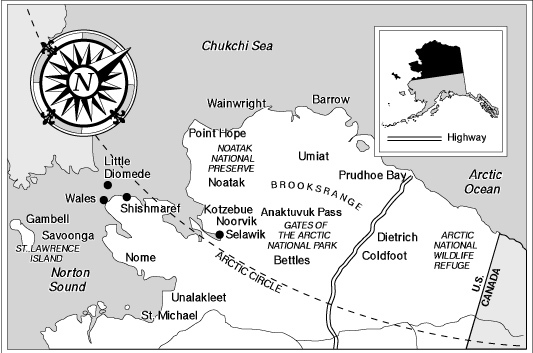 Alaskas two largest Eskimo communities, Kotzebue and Barrow, and historic Nome, are the major towns in this region. The only road access into Arctic Alaska is the Dalton Highway, a gravel service road that links Prudhoe Bay to the States public highway systems. The Yukon River courses nearly 2,000 miles across Interior Alaska and Canada, from the historic Klondike to the Bering Sea. The Native people of this land are largely Athabascan Indians, known for their intricate beadwork. 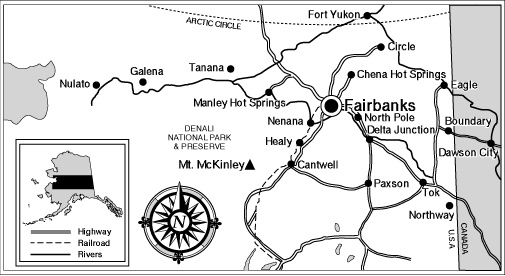 At the heart of the region is Fairbanks, Alaskas second largest city. Born in the gold rush, this trade and transportation center houses military bases, and the main campus of the University of Alaska. Denali, the highest mountain in North America, is surrounded by Denali National Park and Preserve. As part of the extended Alaska Range, this area boasts spectacular mountain vistas, berry-laden tundra, and an abundance of wildlife including caribou, moose, Dall sheep, and grizzly bear. The Interior is one of the best locations on earth for viewing the Northern Lights. Visitors traveling the Alaska Highway enter the state near Tok in the eastern portion of this region. 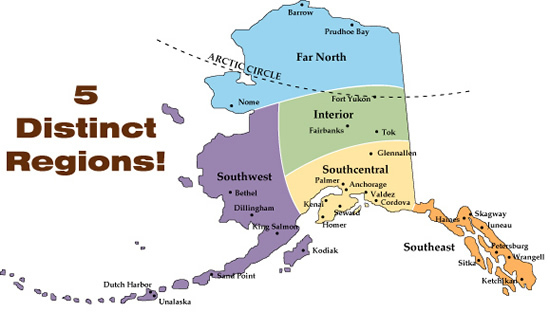 Southcentral is Alaskas most easily accessible region. More than half of Alaskas residents live here, a recreational paradise of glaciers, fjords, roadside lakes, clamming beaches, and salmon streams. Here, fall puts on a spectacular show. The area encompasses farmlands, fishing towns, national parklands, ski resorts, and a modern city. 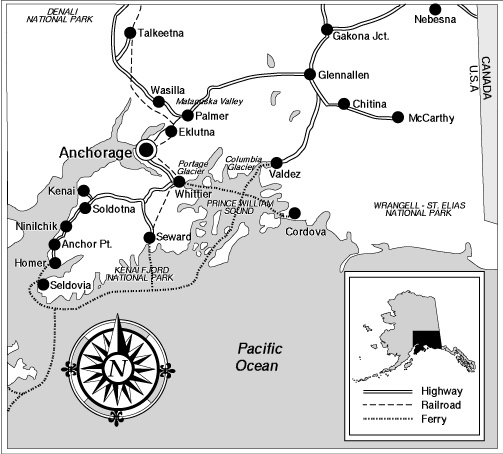 It is served by all the states major highways, the Alaska Railroad, and the Alaska Marine Highway (ferry) System. Anchorage is the hub of a busy transportation network linking large areas of the state. Kenai Peninsula, a scenic and fly-fishing paradise, and Kenai Fjords National Park lie southwest. Wrangell-St. Elias National Park, to the west, contains nine of the 16 highest peaks in the U.S.
Carved by glaciers and blanketed with majestic hemlock and spruce, Alaskas Inside Passage is a region of pristine water, snow capped mountains, deep fjords, and forested islands. With its wet, mild, maritime climate, this area is prime habitat for bald eagles, sea lions, porpoise, and whales. Much of Southeast Alaska is part of the Tongass National Forest, a 16.8 million acre rainforest. Glacier Bay National Park has 16 active tidewater glaciers. Misty Fjords National Monument near Ketchikan has 3,000 foot cliffs rising directly from pristine ocean channels. The picturesque coastal communities are rich in history and Native traditions. 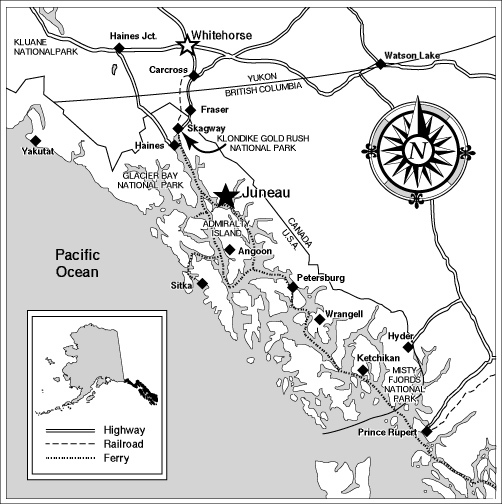 The capital city of Juneau was founded during the Gold Rush, while Sitka was originally the capital of Russian America. Petersburg is rich in Norwegian heritage. The Gold Rush "Days of 98" are alive in Skagway. Ketchikan boasts the worlds largest collection of totem poles. In Haines, a Native cultural center is housed in historic Port Chilkoot.